For a number of months, I've had a warning on the MREInfo.com website recommending that people avoid purchasing Wornick's Eversafe civilian MREs because of problems with one of their online distributors. 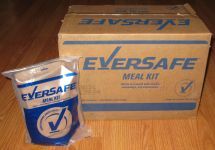 After working directly with Wornick, I'm pleased to report that the issue is resolved and I'm once again recommending the Eversafes as a good brand of civilian MRE to purchase. The main problem we had was with one online seller, MREStore.com, who was representing themselves as the sole distributor of Eversafes. According to Wornick, MREStore.com is not an authorized distributor as we still recommend NOT purchasing Eversafes through them. I am never able to understand the thinking that goes into the menu choices for the civilian MREs. I give Wornick's credit because they do provide crackers to put the peanut butter and cheese spreads on. 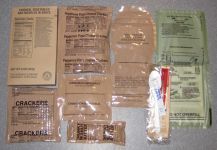 Some of the civilian MRE throw in a pack of jam or cheese to pump up the calorie count but provide nothing that you can spread it on. I do seriously question the wisdom of including Cinnamon Imperials with every single meal. 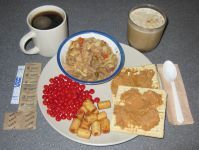 They show up occasionally in military MREs and as an occasional item are enjoyable, but with every single meal? By the end of the second day I would be barfing at the mere sight of a bag of cinnamon candy. By the end of the first case, I would be seriously considering starvation as being preferential to chocking down another bag of pizza combos and cinnamon imperials. With the admission that if you are hungry enough, you WILL eat anything, I am stockpiling as much diversity as possible. The Eversafes are not on my list.